At BrandBastion, we analyzed over 20,000 Instagram comments across 11 QSR brands' ads to understand the threats and potential opportunities facing brands on social media when advertising. Ads analyzed include brands like McDonald's, Subway, KFC, Domino's, Wendy's, Taco Bell, Jack in the Box, Burger King, and Dunkin' Donuts. 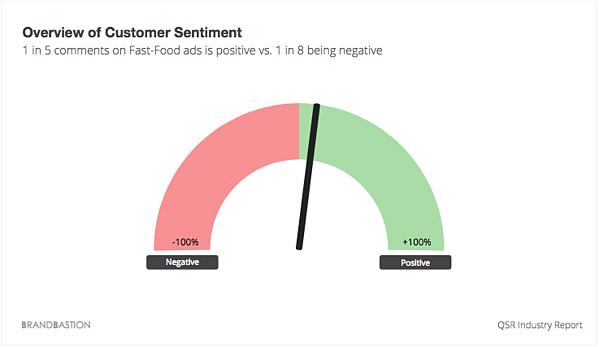 On ads, people are 1.9x more likely to share love for a fast food restaurant than badmouth it. Customers are more likely to share negative feedback about menu items rather than positive. Employees are 1.4x more likely to comment negatively rather than positively about their employers. There are over 200,000 fast food restaurants in the United States alone and an estimated 50 million Americans eat at one of them every single day. The competition is fierce and advertising to customers with low switching costs poses a huge challenge for marketers. Despite ad spend on Facebook having grown by 74% year over year, brands are still struggling to manage their social media properties. In-house customer service teams concentrate their efforts on organic post comments, while comments on paid Facebook and Instagram ads are often left unattended. Given the massive growth in online advertising, with a forecasted $48 billion to be spent on display ads in 2018, it’s crucial to understand what works and what doesn’t. 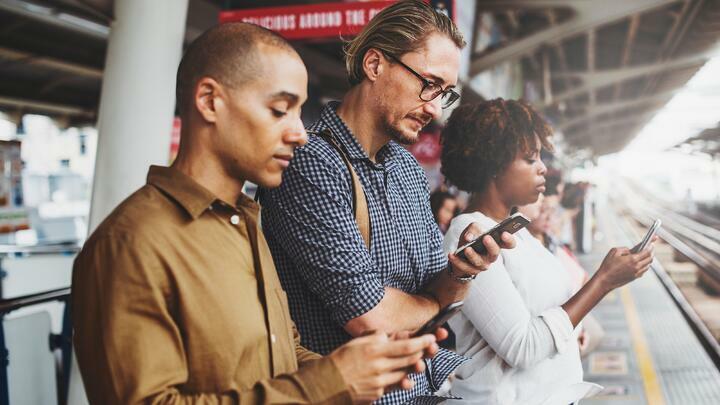 The effectiveness of social media ad spend is directly impacted by spam, brand attacks, competitor promotions, unanswered inquiries and social media crises. Millions of comments are posted each day across brand ads and accounts, in volumes too high for humans to handle. 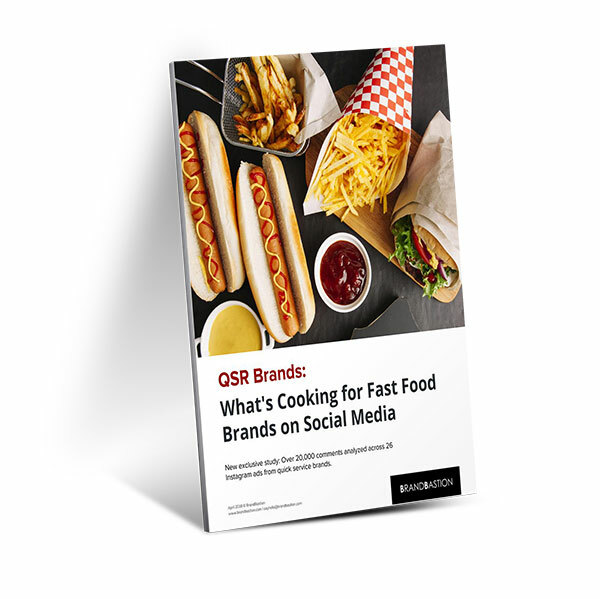 We studied over 20k comments received on Quick Service Restaurant (QSR) Instagram ads running in the US and Canada to gather insights that QSR brands can learn from and leverage on while advertising on social media. Want to change the odds and have a comment section that works in your favour by efficiently managing comments on ads? Want a similar analysis like this for your brand's campaigns? 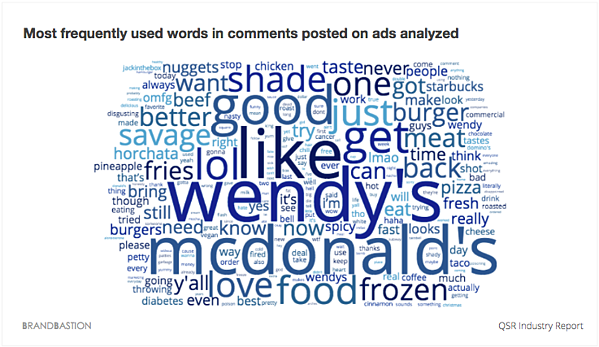 On ads analyzed, 1 in 5 comments on Fast-Food ads is positive vs. 1 in 8 being negative. The top words used in comments are predominantly positive. By tracking sentiment on ads you’ll get a better understanding of how the campaign was received and its success. You’ll also gain insights on a campaign level into the sentiment and ad topics, be able to benchmark campaigns, and understand how brand perception and topics discussed have developed over a longer period of time. At times, ads can receive high amount of negative reactions. This could be due to a range of different factors such as: ad creative, audience targeting or recent events. Typically, negative comments attract more negative comments. This snowball effect can result in an avalanche of negative comments if not managed properly. Below is a topical analysis for negative comments received across all the ads we analyzed. 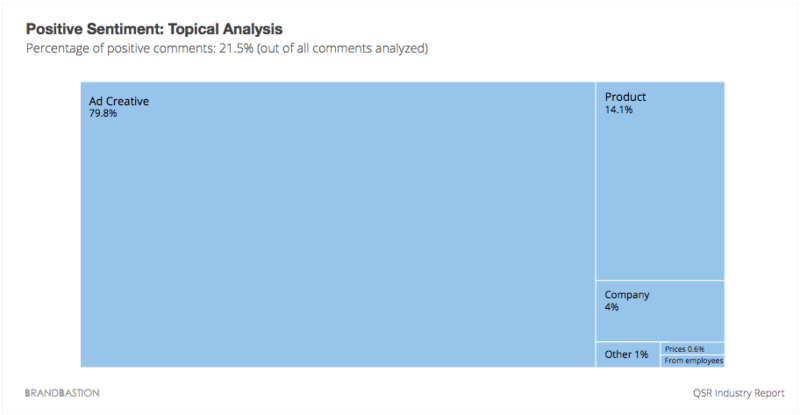 32.7% of all negative comments were negative towards the ad creative. Ads on social media are reaching millions and Facebook’s relevance score helps advertisers optimize their ads. The score is updated in real-time as users interact with the ad. What the relevance score is lacking is the qualitative reaction to the ad’s creative that can be found in the comments. When negative feedback rises and the relevance score drops, it may be an indication that it’s time to refresh the creative. Negative comments about ad creative ranked #1 in the most talked about negative topics. 27.2% of all negative comments were directly related to the food served. Many consumers take to the comments section of ads to post negative feedback about menus or the way products are made. Gathering insights on why prospects are negative about your products can help in continued product development and enhancement. Negative comments about products ranked #2 in the most talked about negative topics. There is an astonishing amount of information and lessons to be gleaned from the comments you receive. When more than 1,000 customers are shouting “bring back spicy nuggets”, you might want to consider that. Customers and prospects are often happy to tell you what they think about your products, what can be improved, and what else they would love to get from you. There are amazing opportunities not only for marketing, but also for product development and customer service teams to streamline their processes and to save cost simply by giving customers what they asked for. 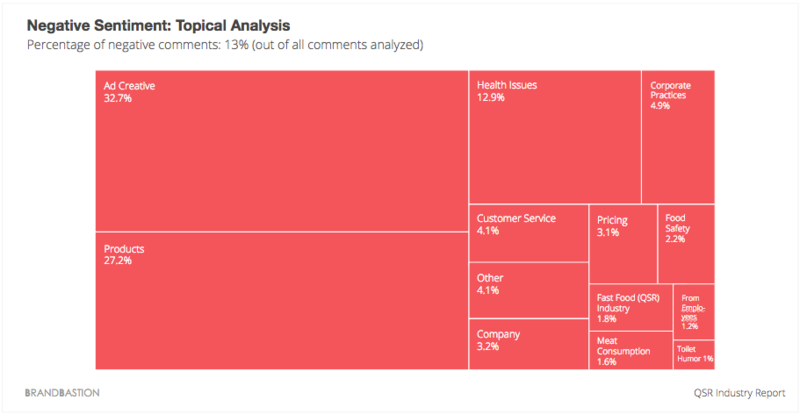 12.9% of all negative comments were related to health issues. Generally, fast food has a reputation for being unhealthy, while consumer tastes in the United States continue to drift towards healthier options. This is also reflected in user engagement on ads. While still a risk, the industry is already fighting back by introducing healthier menu options. Instead of using broad classifications, make use of Facebook’s intricate audience targeting features. Listen to what people are saying on your ads, know the trends, use niche interests to your advantage, and regularly review your buyer personas to make sure that your audience targeting matches. What are people being positive about? A study commissioned by Facebook shows evidence of “massive-scale emotional contagion through social networks”. Simply put, people can pass on positive or negative emotions to others through the network. Particularly, users have significantly more positive emotional responses when exposed to ad and marketing messages re-posted by other users than pure banner ads. Once a trail of positive comments has accumulated on an ad, that positivity begins to spread exponentially. Across the ads analyzed, people are more likely to post a direct positive reaction towards the ad creative than a negative one. The direct positive reaction to ad creative is 3.9x higher than the negative reaction. In addition to relying on sales figures, product development teams can now gain real-time, qualitative insights on new products that are rolled out. This allows them to make quicker and more informed decisions about their product mix. Organic feedback from customers via comments on ads are more likely to be honest and unbiased, compared to collecting customer feedback from structured surveys. With intelligent data mining solutions, it is possible to analyze and understand what is working and what isn’t more efficiently than ever. Customers are more likely to share negative opinions about products rather than positive. The amount of negative comments about products is 21% higher than the amount of positive comments about products. Perhaps surprisingly, people are more likely to leave positive comments on a fast food brand’s social media ads compared to negative comments. This bodes well for marketers, given how many customers tend to use social media to validate their brand choices. The power of social endorsement means that if a customer sees many positive comments on a brand’s ad, it will increase the likelihood of that particular customer also reacting positively. 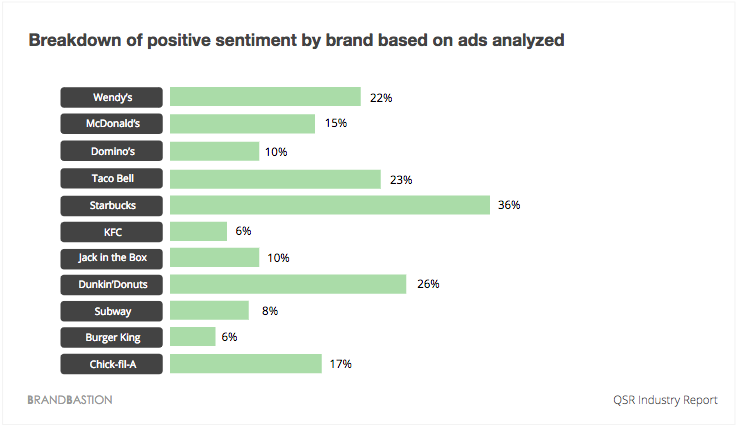 On ads analyzed, people are more likely to share the love for the brand rather than bad mouthing it. The amount of positive comments about the company is 1.9x higher than the amount of negative comments. In addition to monitoring performance, comments received from prospects and customers should be monitored daily or preferably in real-time, keeping in mind the snowball or amplifying effect that social media has. These comments are where the sales truly happen, and if they’re ignored and not responded to, conversion opportunities will be missed. Conversely, PR crises, toilet humor or comments pushing customers to competitors or spammers can hijack your well planned ads and distract from the real topic. 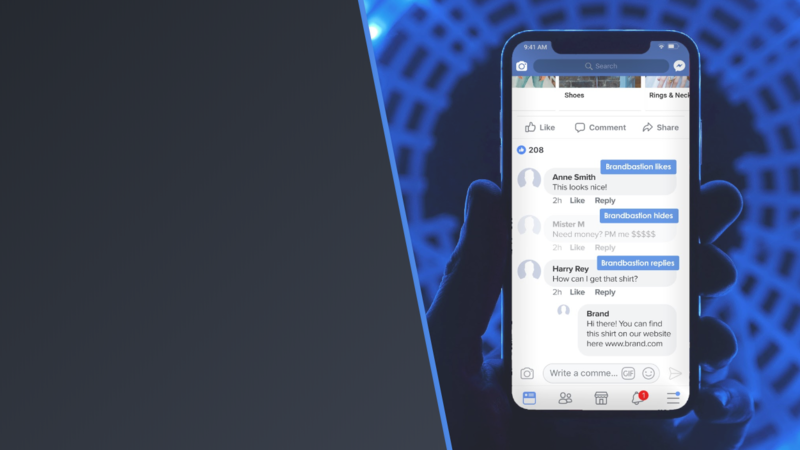 It may not be realistic to read every single comment received on an ad on a daily basis - especially if you're a large brand receiving thousands of comments on one ad and running hundreds of ads regularly. But that is where automated, machine learning and natural language programming-based solutions such as BrandBastion come in. Our technology uses neural networks, natural language processing and machine learning for content processing. Our content processing system processes all comments and takes actions based on pre-configured guidelines. Our trained teams of quality assurance managers and content processing specialists oversee the processes ensuring we have the highest level of accuracy. Topics identified are based on current context and can change over time.